Just over a year after Michael Brown’s death became a focal point for a national debate about policing and race, Ferguson and nearby St. Louis suburbs have returned to what looks, from the outside, like a kind of normalcy. Near the Canfield Green apartments, where Brown was shot by police officer Darren Wilson, a sign reading “Hands Up Don’t Shoot” and a mountain of teddy bears have been cleared away. The McDonald’s on West Florissant Avenue, where protesters nursed rubber bullet wounds and escaped tear gas, is now just another McDonald’s. Half a mile down the road in the city of Jennings, between the China King restaurant and a Cricket cell phone outlet, sits an empty room that the St. Louis County Police Department keeps as a substation. During the protests, it was a war room, where law enforcement leaders planned their responses to the chaos outside. One day last December, a few Jennings police officers flicked on the substation’s fluorescent lights and gathered around a big table to eat sandwiches. The conversation drifted between the afternoon shift’s mundane roll of stops, searches, and arrests, and the day’s main excitement: the officers were trying out a new software program called HunchLab, which crunches vast amounts of data to help predict where crime will happen next. The conversation also turned to the grand anxieties of post-Ferguson policing. “Nobody wants to be the next Darren Wilson,” Officer Trevor Voss told me. They didn’t personally know Wilson. Police jurisdiction in St. Louis is notoriously labyrinthine and includes dozens of small, local municipal agencies like the Ferguson Police Department, where Wilson worked — munis, the officers call them — and the St. Louis County Police Department, which patrols areas not covered by the munis and helps with “resource intense events,” like the protests in Ferguson. The munis have been the targets of severe criticism; in the aftermath 2014's protests, Ferguson police were accused by the federal Department of Justice of being racially discriminatory and poorly trained, more concerned with handing out tickets to fund municipal coffers than with public safety. The officers in Jennings work for the St. Louis County Police Department; in 2014, their colleagues appeared on national TV, pointing sniper rifles at protesters from armored trucks. Since then, the agency has also been called out by the Justice Department for, among other things, its lack of engagement with the community. Dozens of small, local municipal agencies handle policing in parts of St. Louis County. The St. Louis County Police Department covers areas not policed by the “munis,” including the city of Jennings, Mo. The darker areas in the map show the areas within their jurisdiction that HunchLab has identified as high risk. Still, the county police enjoy a better local reputation than the munis. Over the last five years, Jennings precinct commander Jeff Fuesting has tried to improve relations between officers — nearly all white — and residents — nearly all black — by going door to door for “Walk and Talks.” Fuesting had expressed interest in predictive policing years before, so when the department heads brought in HunchLab, they asked his precinct to roll it out first. They believed that data could help their officers police better and more objectively. By identifying and aggressively patrolling “hot spots,” as determined by the software, the police wanted to deter crime before it ever happened. At the same time, a growing chorus of activists and academics worry that the reliance on data is a sign that police departments have not adequately heeded the lessons of Ferguson. Kade Crockford, the director of the Technology for Liberty program at the Massachusetts ACLU, says that predictive policing is based on “data from a society that has not reckoned with its past,” adding “a veneer of technological authority” to policing practices that still disproportionately target young black men. In other cities, some police departments are even moving toward predicting which people, rather than which places, are most crime-prone. For police who are trying to deter crime, some predictions are more valuable than others. Murder may be a serious crime, but residential burglary can be more easily deterred by a police officer’s presence. 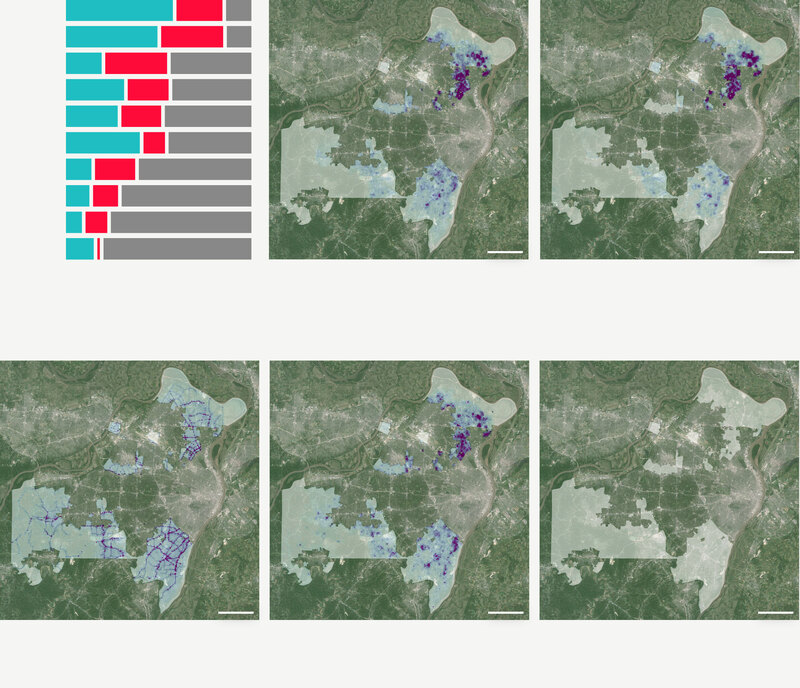 HunchLab determines what data is most useful for prediction of each crime. In some cases, geography — the locations of prior crimes or particular landmarks — is the most important factor. In others, time — day of week, month of year — takes precedence. 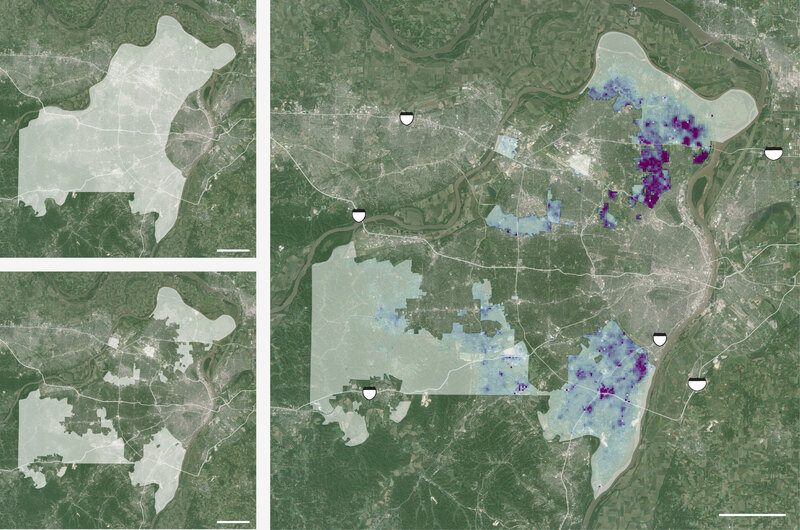 In St. Louis, the HunchLab algorithm took the 10 crimes that the police department had selected, calculated the risk-level for each, and combined them to determine where patrols would have the most impact. Aggravated assault (assault with a dangerous weapon) makes up 18.5 percent of the overall risk score assigned to a cell. The darkest regions on this map represent cells with a 1 in 320 chance of at least one aggravated assault taking place there during the shift. Gun crime (all homicides, robberies, and aggravated assaults with a firearm) makes up about 16.5 percent of the overall risk score. The darkest regions represent a 1 in 850 chance of at least one gun crime taking place. Driving while intoxicated makes up 10 percent of the total risk score. The darkest regions represent a 1 in 1,300 chance of at least one DWI taking place. Trespassing makes up about 10 percent of the total risk score. The darkest regions represent cells a 1.7 percent chance of at least one act of trespassing taking place. Homicides make up 0.66 percent of the total risk score assigned to a cell. The two darkest cells on this map present a 3 percent chance of at least one homicide taking place. “Cops-on-dots,” as it’s sometimes known, has often been associated with Bratton’s other major legacy, “Broken Windows,” in which police target low-level offenses like graffiti and public drinking, creating a sense of public order that is believed to deter more serious crimes. Such tactics have been credited with helping bring down crime rates, but they have also contributed to the aggressive targeting — and stopping and searching — of black people, fostering resentment of police in many communities. St. Louis officials had been using data to send police to patrol hot spots since 2009; today the city holds weekly meetings for commanders to discuss why certain crimes keep hitting certain places, and how to address it. When one precinct captain noticed a lot of robberies of appliances from houses under construction, officers were instructed to keep track of building schedules. In agencies across the country, the more commanders looked at the data, the more timely their responses to that data could be, and crime analysis started edging toward real time. The dream was to go beyond the present. In the summer of 2014, a couple of months before Ferguson erupted, St. Louis County Police Chief Jon Belmar returned from a conference of police leaders in Boston, where he had been impressed by presentations from mathematicians and data analysts. He told his aide, Sgt. Colby Dolly, that he wanted their department to join dozens of cities already using predictive policing software. As Dolly studied the predictive policing market, he found it was crowded with competitors. Since 2009, the National Institute of Justice had been funding research into crime prediction, transforming the field into big business. IBM, Hitachi, and Lexis had all begun to offer ways to predict crime through data. Sgt. Colby Dolly at the St. Louis County Police Department in Clayton, Mo., in December. The leader in the field is PredPol, a company that grew out of a team of researchers and officers working under Bratton during the chief’s mid-2000s stint in Los Angeles. PredPol’s algorithms digest years of data on crime locations, times, and types, spitting out the spots most likely to be hit by crime again. After using PredPol for four months, police in the Foothill Division in the San Fernando Valley claimed that property crime dropped 13 percent, while in the rest of the city, it rose by 0.4 percent. 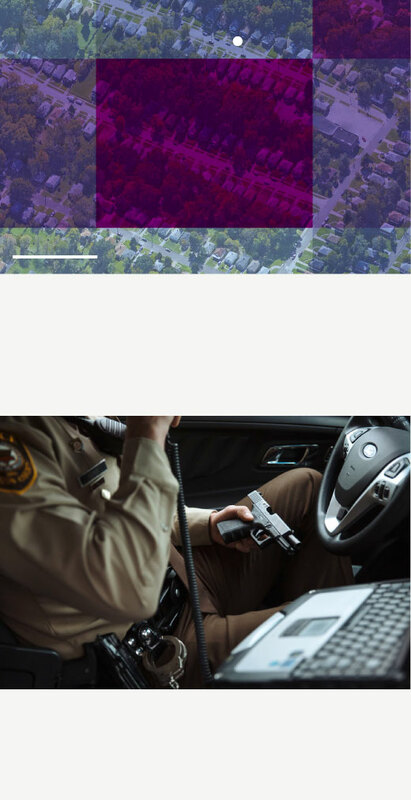 PredPol has received millions in venture capital funding and is now used by more than 50 police agencies in the US and UK. But Dolly was attracted by Azavea’s ability to analyze the impact of businesses, churches, and weather patterns on criminal activity. It was also cheaper: Azavea quoted around $50,000 for a year of HunchLab, where PredPol was asking for roughly $200,000. Azavea’s employees have a Silicon Valley ebullience — their website mentions “ping pong tournaments, team runs, hackathons,” and “chess matches over lunch” — but they do not share the tech industry’s talk of “disruption.” Their rhetoric is civic-minded; the company’s other projects include tools to analyze legislative districts, as well as an app that helps city residents map the locations of trees in order to study their environmental impact. As predictive policing has spread, researchers and police officers have begun exploring how it might contribute to a version of policing that downplays patrolling — as well as stopping, questioning, and frisking — and focuses more on root causes of particular crimes. Rutgers University researchers specializing in “risk terrain modeling” have been using analysis similar to HunchLab to work with police on “intervention strategies.” In one Northeast city, they have enlisted city officials to board up vacant properties linked to higher rates of violent crime, and to advertise after-school programming to kids who tend to gather near bodegas in high-risk areas. The shifting risk of robberies over the course of 24 hours in December. The darkest regions on this map represent areas with the highest risk of a robbery taking place. A few hours before police officers in Jennings started their afternoon patrol, Dolly sat down at his computer at police headquarters. He logged into the HunchLab website and pulled up a map. The sprawling metropolis was covered in little bright dots. He clicked to zoom in, and the dots grew into transparent boxes, each covering a space roughly half the size of a city block, and each tinted green, orange, red, purple, blue, pink, or yellow. The colors indicated which type of crime was most likely to hit that box: green for larceny, orange for gun crimes, red for aggravated assault. Jennings, divided into HunchLab squares on the morning of December 15, 2015. The darker the square, the greater the risk that a crime will occur. Note: HunchLab does not make predictions for squares containing police stations or hospitals as the incidents reported at these places may include inaccurate locations. A few hours later, Thomas Keener arrived for his afternoon shift, checked his gun, got into his squad car, and pulled up the same map. Ten hours a day, four days a week, Keener’s primary job is to answer 911 calls and provide backup to other officers. When calls don’t come in, he patrols. Keener, 27, grew up in southern Missouri and graduated from the police academy six years ago. He is unfailingly polite. While his peers wear short sleeves, he chooses a long-sleeve khaki uniform and a dark brown tie, a formal get-up that, coupled with his buzzed hair, accentuates his boyishness. St. Louis County police officer Thomas Keener uses HunchLab in his patrol car. The shift rolled on, and Keener got a series of calls: to help a man who had overdosed, to assist with an arrest at the police station, to help look for some young men in hoodies suspected of a burglary. The day was proving to be a safe one. “I’m going to choose to credit the patrols with that,” Keener said. Driving through Jennings, it was clear Keener already had a predictive map stored in his brain. He pointed out non-descript yards and houses where he had been called to the scene of homicides, burglaries, and gang shootings. He continued through particular blocks of residential neighborhoods where HunchLab had placed red and orange boxes to indicate a risk of aggravated assault and gun crime. The streets were lined with crumbling little brick houses. In a few yards, signs reading “We Must Stop Killing Each Other” had been stuck into the dirt. As Keener drove through the bottom left corner of a HunchLab box — red to indicate a high risk of aggravated assaults — he noticed a white Chevy Impala with a dark window tint, dark enough to merit a traffic ticket. Keener decided the smell gave him probable cause for a search. He told the young man to step out, frisked him, and asked him if he had anything “I should know about.” The man said he had a gun. Keener found a black Glock 23 pistol, .40 caliber, under the seat. He took it back to his car, noticing it had no magazine — just a bullet in the pipe. “Pretty big,” Keener said, turning the gun in his hands. An area in southwest Jennings that HunchLab has identified as having a high risk of aggravated assault. Keener checks the registration of a Glock 23 pistol he found while searching a car near this square. Keener checks the registration of a Glock 23 pistol he found while searching a car. While the man paced, Keener looked up his name and the gun’s ID number. It didn’t turn up as stolen. It is legal to have a gun in your car in Missouri if you’re over 18 and not a convicted felon. The man had been arrested, but never convicted, for stealing a gun. Keener let him go with a ticket for the window tint. That HunchLab had sent him to a location where he may or may not have averted illegal activity was, for the moment, tangential; it would not be clear for months whether crime rates in Jennings might be affected by the program. Research on the impact of predictive policing programs is still in its infancy. Last year, PredPol researchers published a study finding that sending patrol officers to several areas of Los Angeles predicted by their algorithm led to a reduction, on average, of more than four crimes per week in these neighborhoods — twice as efficient as human crime analysts. The researchers said the savings — resulting from not having to investigate and prosecute crimes that otherwise may have happened — could reach $9 million per year. Jeremy Heffner, the product manager for HunchLab, is careful about making promises; he argues the results will vary based on how a particular police agency uses their analysis. 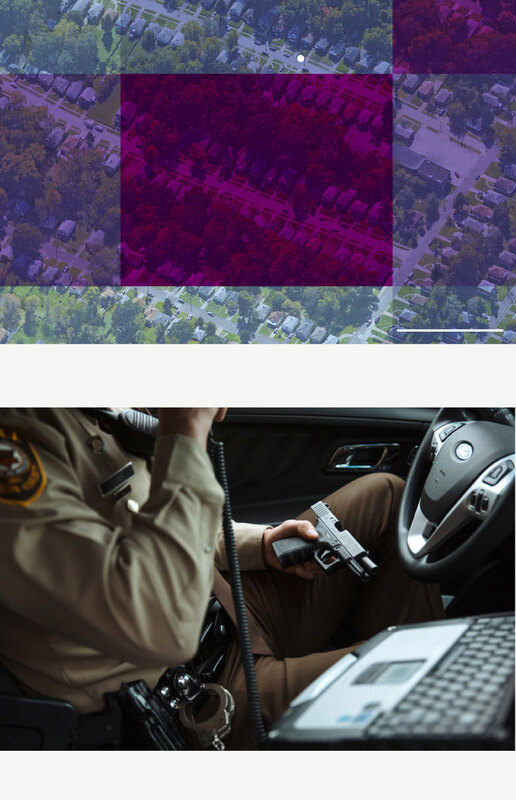 “By having more accurate locations, we amplify the effect a meaningful tactic may have,” Heffner told me, “but you still need a meaningful tactic.” Studies of HunchLab’s effectiveness are underway in several cities, and researchers in Philadelphia are comparing patrolling in marked police cars to sending unmarked cars, which could quickly respond to crime, but might not deter it. Keener performing a search during a stop just outside the area designated as having a high risk of aggravated assault. Many at the top of the county police agree with Chasnoff, and are interested in finding ways to use predictive policing software to address crime through other government resources. “We can’t just have the criminal justice system solve our problems,” Belmar, the St. Louis County police chief, said the morning before Keener’s shift. Throughout his shift, Officer Keener witnessed hints of simmering distrust. At one point, several children danced in the street, which he said was locally understood to be an insult to police. Later on, just outside one of the HunchLab boxes, he drove by a house where, he said, a drug dealer lived. A suspicious-looking rental car was parked outside. As he slowed down and peered out, the car door opened and a woman — black, maybe mid-30s — emerged. She pointed at the police vehicle to someone in the car and scrunched up her face in disgust. Keener turned back toward the dashboard screen and rolled away.